As you can see, Google changed Omaha installer system. I'm still very trying to find new URL pattern. As soon as I detected it, I will write to here. I hope, it's possible specific string reading from XML in NSIS. Need reading "codebase" string in the XML URL. Wow Bernat! Again you've succeeded! You're welcome. I enjoyed helping you. And this new installer will be useful for all. Very thanks. I use your Java, Flash, and Chrome; so I put Iron into \IronPortable. And it works on Java test page, but not with 31. Any idea? No reason to change default folder name: ChromePortable. Hola, (Portable Iron) no puedo reproducir nada me solicita el complemento de Adobe Flash Player y ya lo tengo instalado, como se podria solucionar eso, gracias. (Iron Portable) Gracias de todas formas pero no puedo instalar me dice que no esta instalado no esta muy claro las carpetas el orden, gracias igual. OK funciono, muchas gracias Bernat, muy amable como siempre respondiendo nuestras dudas y preguntas. Gracias. Hi Bernat, can we just download the srware_iron/chrome directly and then use your installer to create the portable like it used to be? Downloading from your installer is just way to slow from Indonesia. Just so you know. Just run installer in same folder as srware_iron.exe. Problem with your Windows localization. Try english installer (multilingual program). Thanks. This one is ok. Strange thing with this Windows localization - all other installers form this site works fine. My windows is in Polish language. Polish was missing and Arabic in first line in place of English. Thanks for your work. Love your site! Would you please consider to make the 64-bit Chrome into portable version? I hope pureocean will found it. Hey i want to use chrome on my ramdisk partition, i don't want to save cache on %temp%. How to do this? When I set Google chrome portable as default browser, following link is used to use as default brower. It's very curious why this happens, and it's more work for me because I have to set up my bookmarks and extensions, as well as some other customized options. Don't set Chrome itself to be default browser otherwise launcher is no more used and it is no more portable. I am using portable chrome as well as many other portable apps on my desktop instead of standard installation apps. portable apps are still there. I have downloaded Chromium Portable 64 bit (0.6MB) but where am I supposed to install it please? The Chromium link is not working for me. I can download the file but when I try to start the installation, I get a 404 error (file not found). 64 bit versions of Chrome have moved from the Dev and Canary channels to Beta. It would be great if we could get links to 64 bit versions of Chrome. Probably won't be too long before the 64 bit release version is available. I'm none the wiser after reading Support.When I browse to & try to install Chromium Portable in chrome-win32 folder I get the following message. Am I supposed to create subfolders & or something else? This is not a problem of folder but download links of installers are no more available. Chromium online installer working again. The 32 bit version of Chromium works but not the 64 bit version. Checking the 64 bit box and trying to install results in a 404 file not found error. So, only the 32 bit Chromium online installer is working. 64 bit online also is working. Okay, thank you! I tried again and 64 bit online worked but only with 32 bit also checked. When I unchecked 32 bit, leaving only 64 bit checked, I got the 404 error every time. I guess the installer doesn't work unless both 32 and 64 bit boxes are checked. No big deal. Chrome 36 (stable) and 37 (beta) are not affected yet. You are free to edit and recompile NSIS scripts. Your chrome portable is OK.
Any chance of getting a portable version of 64-bit Chrome? 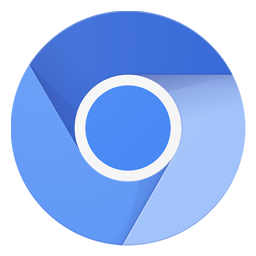 The 64-bit version of Chrome has been released to the stable channel. That 64-bit link for Chrome portable worked PERFECTLY! Installed as a portable app without a hitch. Thank you Bernat, the 64-bit Portable Chrome works perfectly. Excuse me dear bernat but the file "Chrome_Portable_Multiversion_Online_Multilingual.exe" Norton AV continuously detects as : Troian.Gen.SMH.2 and quarantines or deletes,I would have the need to update Chrome Dev + Stable to the latest version, but unfortunately I'm stuck yet to 40.0.2214.6, kindly you can help me? Tested without virus with Kaspersky. When I try download 40.0.2214.91 x86, I can download only 39.0.2171.99. x64 - ok. Please, do something. Thank you for your work =) You are the best. Previous 32-bit installer is now working again. I prefer previous installer because I like to test the Canary version. Chrome and other Chrome browsers don't come with Flash anymore. Could you update your Flash installer and make Pepper Flash plugin an installer too. Probably like that with Iron since it's based on Chromium. Well I don't know what to say then. Fresh copy of Chromium x64, fresh copies of Shockwave Flash plugins and the browser won't recognize them. now you need to got to chrome:flags & Enable Enable NPAPI for flash to appear in chrome:plugins. Enable NPAPI was not in previous 42 Chromium x64 but now need to be activated to see Flash and Java. After enabling, don't click Restart Now but close and restart by launcher. Buck Ofama: I deleted my previous message while you were posting. Thanks,Bernat.I'm aware of that,From Sept. '15 no NPAPI support. Thanks Buck Ofama, that was the problem. No problem.Thought it would be.Glad it's sorted. You can use pepperflash from chrome with portable chromium, "ChrOpera", Vivaldi and Iron. Added Pepper Flash Plugins with updated launchers. HI! I Keep Getting SendRequest Error Messages When Installing The 64Bit Version Of Google Chrome DEV Build Portable, MIGHT I ASK How Do I Correct This Error And Solve This Problem ? Now I wanted to update so I ran "ChromePortableInstaller-online". Since yesterday I tried to work with version 37,39,41,42 but none those versions seems to be working - what I mean - after that I have no personal settings or extensions kept. The same situation appears when I try to run it from other computer. Any idea what this means?
" I ran "ChromePortableInstaller-online"... I tried to work with version 37,39,41,42"
This is Chrome_Portable_MultiVersion_32-64-bit_Multilingual_Online and you can download only 41, 42 or 43. Settings are created and kept in Data\Chrome. but the installer required access to web! Where I put my chrome installer .exe for run setup extractor? Ok. Is possible share only launchers file? 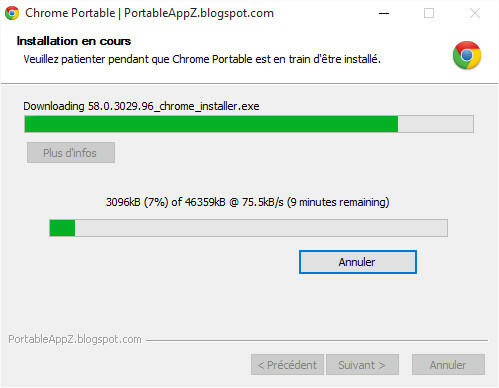 Open Chrome_Portable_MultiVersion_32-64-bit_Multilingual_Online.exe with 7-Zip and extract App folder and ChromePortable.exe in a ChromePortable folder. Create a Chrome64 folder in App. Open 48.0.2564.103_chrome_installer_win64.exe with 7-Zip and extract chrome.7z in a temp folder. Open chrome.7z with 7-Zip and open Chrome-bin folder: extract chrome.exe in Chrome64. Open 48.0.2564.103 folder (in Chrome-bin) and extract its content in Chrome64. Finaly create a 0 byte file "First Run" (without extension) in Chrome64. Thanks you very much! You are great! buenas, quiero saber como puedo hacer para actualizar a la ultima version de google chrome porque me tira error 1. I have the same message and this is not a problem. For all portable apps (except JDownloader) never let program update itself: run online installer again. Since April 2016 Chrome no more support XP and Vista. I have an old (24/11/2015) version 47.0.2526.73 32 bit tested working on XP SP3. Bernat,do you know when Chromium Portable will be updated to 52.0.2735.0 please? Installer updated (download URL changed). For me all (manifest, exe, dll) is 52.0.2736.0 in 32 or 64 bit. Apologies,my mistake.I downloaded from the old link which was 51.0.2683.0 version.All good now & up to date.Thank you. Iron was updated since over 2 weeks in your online installer. Why don´t you post it??? Is it possible to not run Chromium as admin? Features like dragging files to the browser don't work if it's running as admin. 48.0.2564.116 32 bit offline added. Hi Bernat, the 49.0.2623.112 actually is the latest release for XP/Vista. Would you please update ? does not start. Windows 10 home. What is the reason? Tested working on Windows 10 Home x64. I can't solve a problem I don't have. Tested working from installed Firefox. Hi Bernat, I just drop by here to inform you that there's a new web browser out called Brave, Brave.com and it does not use Google ads etc, it's created by the same people that started Firefox. I hope you may help to make its portable version :) thanks a lot for all your releases all these years!! Many thanks for your help: link added. How i can check if my DEV it's the latest ?? The only way I see is to run installer and click Cancel if the message Replace... is the same version. Hi friends.... can someone help me to add the "Internet Download Manager" extension on this portable version of Chrome ? Effectivement, le lien de téléchargement de chromepass.zip a changé et ne fonctionne que depuis la page de NirSoft. Installeur mis à jour en extracteur. Download 69.0.3497.92_chrome_install.exe was 100% completed. After finishing everything, I moved to installed folder. I've tried more than 10 times. What's the matter with this install problem? You should have 24 files and 7 folders in Chrome folder. Perhaps a problem of space on your drive (or copy speed). Try to install on another drive. I changed chrome installation folder from ramdisk to USB stick drive. Now every installation process was completed perfectly. Not created in normal use. mmm... i have this folder, (deleted and re-create it) otherwise i don't post here! Sound tested with your link on Vivaldi and Chromium portables. Problem is with your computer. Would you reorganize the executable file(such as ChromiumPortable.exe) for Chrome or other browsers? I set ChromiumPortable.exe as Default Web Browser however ChromiumPortable.exe gives warning when multiple tabs open. Je ne sais pas si mon problème est "solutionnable", je suis entrain de migrer progressivement vers windows 10 et je voulais utiliser chrome sur chaque système en continu comme je peux le faire avec Firefox. Je pense que le problème vient de la connexion au compte google car chrome crypte les mots de passe en fonction du PC. I have tried to install Chromium Portable but the launcher do not works anymore. Online installer says "Download of ChromiumSetup.exe: SendRequest Error"
I think that download links are changed (but not in Your online installer). Woolyss Chromium at https://chromium.woolyss.com/ and unzip them inside of the empty folder with version number inserted inside Your online launcher. Sources in Other, you are free to modify and compile. I have tried to install Chromium Portable (32 or 64 bit or both; any type of build) but something block my installation. Do You can prepare for me an installed copy of Chromium ? Open Chromium_Portable_dev-stable_32-64-bit_Multilingual_Online.exe with 7-Zip and extract App folder and ChromiumPortable.exe in a folder. Download Installer of your choice: for instance chromium-sync.exe for v74.0.3689.0 64 bit. You have also to extract chrome.exe and chrome_proxy.exe from Chrome-bin folder to Chromium64 folder.